A friend brought these little bottles of sake from Japan, and I’ve been dying to use them as little vases. The gold one had real gold flakes in it. The gold bottle has Dianthus ‘King of the Blacks’, which has a heavenly scent, a couple of Aquilegia Canadensis and some seed grown Columbine , a Geum of the Borisii type, and an Armeria -Thrift Bees Ruby. 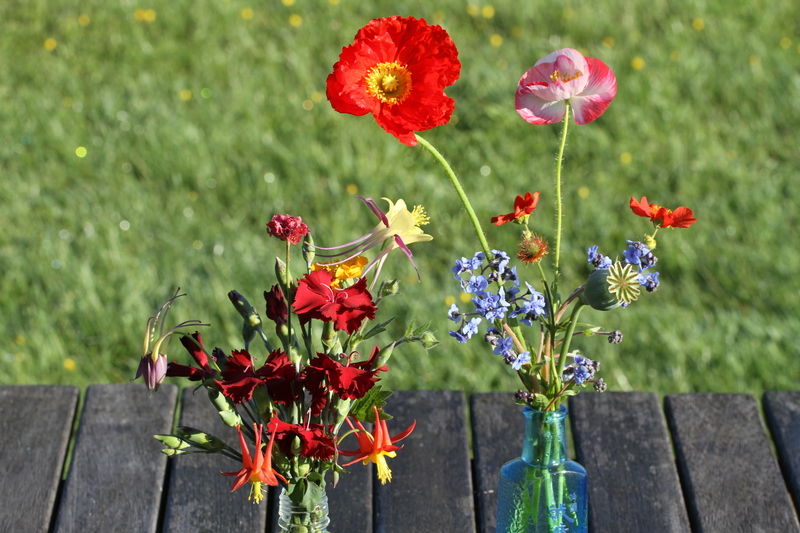 The blue bottle has poppies, an Iceland Poppy and one that came from a mixture and a seed head of another, along with a red Geum, Mrs. Bradshaw I think, and some Cynoglossom Amabile or Chinese Forget-me-not. ‘King of the Blacks’ has been a really strong grower for me, surviving all kinds of neglect. I’ve added a bit of sand to the soil where it’s growing but other than that it has had to fend for itself. As you can see it’s really a dark red, getting darker as the flowers age. Cathy at Rambling in the Garden hosts this meme every Monday so have a look and see if you would like to join in. Snap! Sake bottles! I didn’t realise they came in so many different designs. Lovely colourful collection of flowers too. Thanks, like most Japanese design they seem to be beautiful and varied. I love your little arrangements. Your gillyflower for that is what the Elizabethans called Dianthus. It was the name King of the Blacks which got me remembering the lovely range of old Dianthus which I help to look after when I volunteered at Kenilworth Castle Gardens. You choice of flowers remind us up north of the golden days of early Summer. Many thanks. Gillyflowers is a good name, this one doesn’t seem like a Pink (too big), and I think of Carnations as florists flowers not garden flowers. Do you know why they are called ‘Gilly’? I am enjoying your spring, it takes my mind off the frosty mornings. The little sake bottles make perfect vases. I love the gold one with the wonderful Aquilegia. That’s a flower I’ve always admired but found hard to grow in my area, although I do have one reliable bloomer, ‘Spring Magic’, but I have a wait of several until I’ll see its blooms again. Thanks Kris! Is it too dry where you are for Aquilegia? I mostly grow it here in the shade. Hi Cathy, I bought this one and took cuttings. It is pink but a red-pink that I like. King of the Blacks has been easy from cuttings too and is attractive in and out of flower. The last photo is my favorite. Love the Aquilegia as well and the colors! It is lovely to see your summery flowers as we approach winter here and what a great use of those Sake bottles! Thanks! Today is considered to be the first day of summer here. Beautiful strong colors in your flower choices this week. The bottles are wonderful. The bottles and flowers complement each other beautifully. My Geum Mrs Bradshaw has been flowering from May until last week. She is a real trooper in my garden. She is! I have divided her a couple of times and she does well in difficult spots. I love that brilliant light red. Right now she is floating her red flowers above a sea of blue Chinese forget-me-nots. Oh those are adorable vases from the sake bottles to the cheery flowers. Thank you Donna. They are quite cheery. Your vases make me think of spring, I’m looking forward to the Geums, Columbine, and Dianthus blooming here. They look wonderful in your Sake jars, they make wonderful vases and for small bouquets they make them look much bigger than they are. Thanks Hannah. They hold quite a good amount of water for a small vase. I need a little black tie to go around the top of the gold one. What a lovely late spring collection from your garden. The columbine look like dancers and the sake bottles are beautiful. I was trying yesterday to get the gum off an unusual, stoppered liquor bottle that my son brought home, but the glue proved too resistant and sadly, I had to give it over to recycling. I love unique bottles! Thank you Eliza! The Columbine are so graceful. On the plant, the Canadensis have long dark stems and are arranged so beautifully. I love nice bottles too although time seems to stretch while removing labels. On gummy ones I smear with old vegetable oil and remove with a paper towel followed by hot water. When it works it makes the gum stick to itself and not the bottle. Thanks for the tip, I might give that bottle another try. The little red and yellow one at the bottom I thought was Canadensis, however I bought it from my favourite nurseryman where you need to write your own labels, and sometimes the main labels get moved around. The purple seed one looks related to your wild flower, which is from a mixture of self sown seeds. It’s probably ‘de-hybridising’ itself. I love those ones with the long spurs, they remind me of butterflies. Beautiful flowers! Just what I need to see on a grey winter’s day like today. 🙂 The columbine looks stunning in the gold sake vase – it really brings out the golden centre.